Ringer TheHutt was recently at the 2017 Medieval Fantasy Convention in Germany. Lord of the Rings and The Hobbit actors Adam Brown, Sean Astin, Manu Bennett and David Wenham were among the many guests. Read on for TheHutt’s full report! Readers following actors from The Hobbit on social networks might have noticed that some of them suddenly started posing with owls in front of picturesque medieval walls. No wonder: the atmosphere of the Castle Burg in the German town of Solingen is quite inviting for taking pictures. Historical info: Castle Burg (“Schloss Burg”, literally meaning “Castle Castle”) was built in the 12th century by the Count von Berg. It was destroyed in the 14xx’s and then rebuilt in the 19th century. It is situated on a mountain over the river Wupper. HobbitCon 4 – a merry meeting! 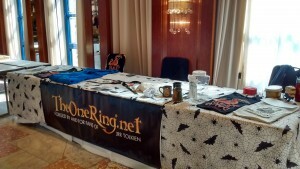 TheOneRing.net’s table at the convention. Thanks to all who stopped by! It’s hard to believe a week has passed already since HobbitCon Vier in Germany. Staffers deej and greendragon were delighted to be there, meeting fellow fans and sharing the fun. As promised, here are some tales of the weekend for those of you who couldn’t be there – or who were there and just want to look back! HobbitCon was held in the Hotel Maritim in Bonn, April 1-3. Folks started arriving on the Wednesday before, and there was an atmosphere of anticipation as more and more people, often laden with suitcases full of costumes, showed up to be reunited with friends. 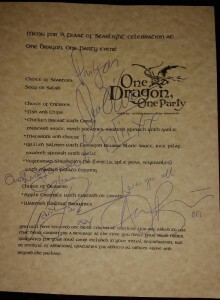 We ran a simple lottery for a nifty little prize in the form of a Menu from last year’s One Dragon, One Party signed by several cast members. The contest is now over and we have ourselves a very surprised and happy fan in Texas by the name of Susan H. The nice thing is, she does not have to wait to see if the campaign will be successful, she will be receiving this signed item in the next few days. We have other really cool items already in the campaign, as well as new ones coming up to add to the campaign as either Perks for specific pledge levels, or other Lottery prizes. We may even do something extra special just for the Professor’s Birthday this weekend. And if you are unable to join us at the party, please don’t despair, we have now added a perk specifically for a Live Stream from the party. We’re hosting a Party of Special Magnificence next February — a toast to all SIX movies, both LOTR trilogy and The Hobbit. We’ve hit and surpassed the 50% mark of our funding goal and there’s 18 days to go. Even if you can’t make it to Hollywood, there are still ways to help out if you’re keen, and some neat perks you can pick up too! So visit our Indiegogo campaign page to see how you can help make it happen — so we can all celebrate Peter Jackson’s Middle-earth movies together! 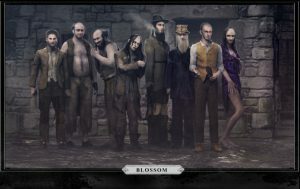 One Last Party campaign extended – and a GIVEAWAY! We’re still working hard to make #OneLastParty – a Party of Special Magnificence – happen, so we can all celebrate together next February! We had many requests from fans who hoped we could extend the deadline, so after much consideration we went ahead and extended to January 18th. It was tricky to choose a date – of course we all want to reach our target as soon as possible, but we wanted to take into account the fact that some folks don’t get paid until Jan 15th, and may want to purchase tickets then. So – due to popular demand, you now have until 18th January to pledge, and to persuade all your friends to buy tickets, too! The goal, of course, is still to reach that target as soon as possible – and to that end, we are holding an exciting GIVEAWAY for all those who pledge before 12noon EST on December 31st! 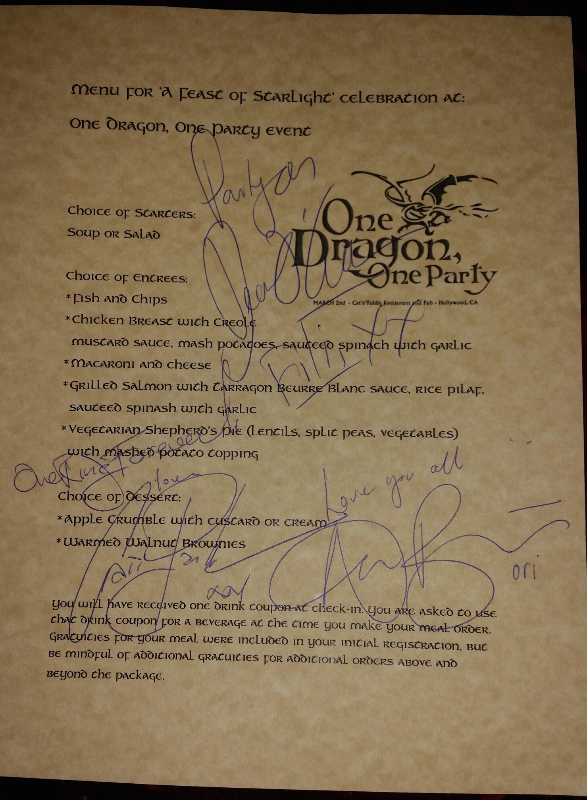 Everyone who has already pledged – and all who pledge between now and then – will be entered into a draw to WIN a Menu from our ‘One Dragon, One Party’ Oscar Moot held 2014 at the Cat & Fiddle restaurant in Los Angeles. This beautiful item, printed on a thick card stock paper, golden marbled, using the Shire Regular font designed by Daniel Reeve (the official Calligrapher for the films), was SIGNED at the party by Adam Brown (Ori), Craig Parker (Haldir) and Dean O’Gorman (Fili). To be in with a chance to win this item, you simply need to have made a pledge of ANY level to the campaign before 12noon EST, Wednesday 31st December. You can give $10 and be part of the big thank you card we will send to PJ et al; you can pledge $200 for a party ticket; you can even snag some exclusive items at higher ‘perk’ levels, (such as a solid gold One Ring from Badali Jewelry, which retails for $924, but which you could claim for only $600 – and that includes your party ticket, too!) Names will be entered into the draw for as many times as an individual has pledged – so if you’ve pledged twice, you have two chances to win! A name will be drawn at random and the winner will be notified by email, and the signed menu shipped out to that lucky person asap. This means that the winner will receive the menu no matter what the final result of our campaign is. Someone is guaranteed to win this special collectible signed by three cast members – all you have to do, to be in with a chance to win, is make a pledge! And if you need any further persuasion to join the party, here’s a video where Billy Boyd chats with staffer greendragon. Towards the end of the interview, he talks about the music he’d like to play at the party; let’s make it happen, so Billy can come and serenade us all! #OneLastParty – see you there! We’re hosting a Party of Special Magnificence next February — a toast to all SIX movies, both LOTR trilogy and The Hobbit. Visit our Indiegogo campaign page to grab your tickets and help make it happen — so we can all celebrate Peter Jackson’s Middle-earth movies together! The One Last Party – tickets available NOW! 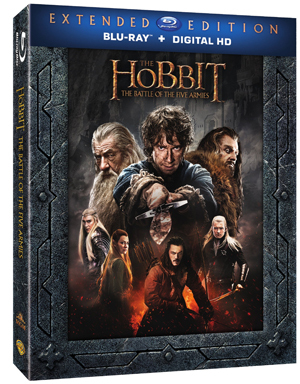 The Hobbit: The Battle of the Five Armies has its world premiere in London today. 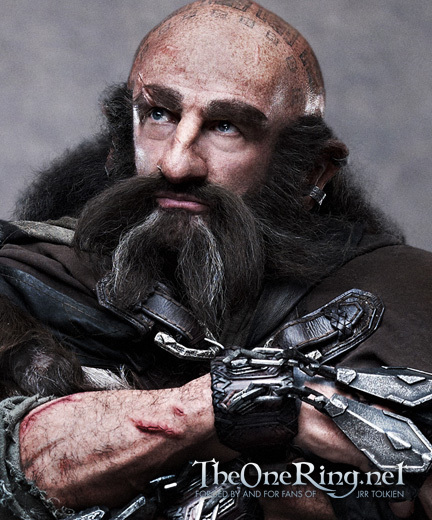 The last of Peter Jackson’s Middle-earth films is nearly here. And so begins the end of the epic journey – mission – quest – thing – we have all been on together. But fear not! We have no intention of letting these films sail into the West without a fanfare! So get ready to celebrate at The One Last Party – There and Back Again: a Party of Special Magnificence, a final toast to all SIX movies, both The Lord of the Rings trilogy and The Hobbit trilogy. Southwark Playhouse, just a few minutes’ walk from the Elephant and Castle tube station, is a fascinating place with a characterful, cosy lobby/bar, and two studio theatre performance spaces, known as ‘The Large’ and ‘The Little’. Emerging playwright Daniel Andersen’s Saxon Court is being presented in The Little. The production, directed by Melanie Spencer, makes skilful use of the intimate space, turning the black box into a workplace, with simply an area on the walls stage right and stage left painted grey to frame the stage. 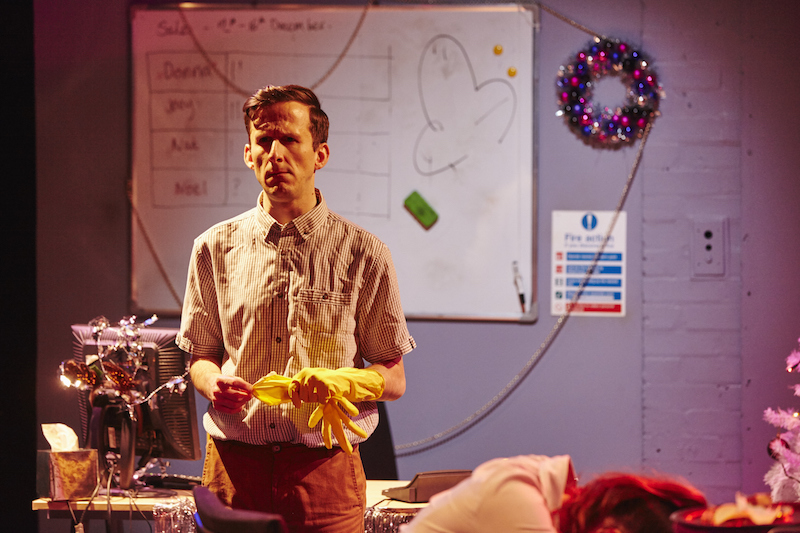 The show tells the tale of a typical London office, on the day of the Christmas party in 2011, at the height of the financial crisis. Things are not going well and someone is likely to get fired – but who will it be? This is listed as a ’16+’ production, and deservedly so – the folks in this office are as raucous, vulgar and boozy as one might expect on party day! Joey and Nat are the older hands in the office, constantly teasing newcomer Noel; receptionist Tash has recently been off for some ‘surgery’ (and it’s fairly obvious from the moment she enters what her procedure might have been! ); they all answer to boss Donna, who is harsh, driven and ruthless. 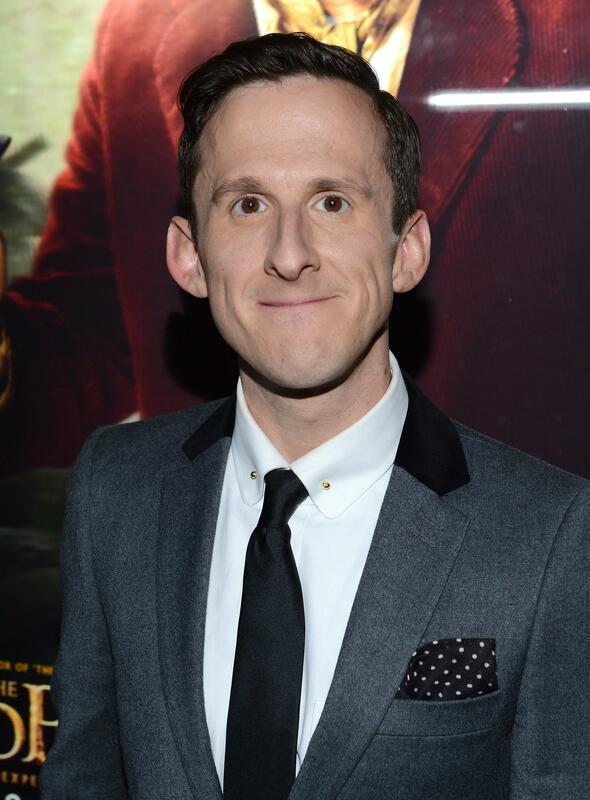 Adam Brown plays Mervyn (unfairly referred to throughout as ‘Ugly Mervyn’! ), an employee from another office who is summoned to meet with Donna. Though Brown has the smallest role to play, his performance is one of the strongest. His Mervyn is funny, gauche, annoying (and, it turns out, as mean as everyone else! ); and yet at the moment when he realizes he might be fired, we are given a glimpse of touching poignancy, before the comedy returns. Actors John Pickard (Joey) and Debra Baker (Donna) also give strong performances. The play is very funny; the almost full house on the night I attended rang with loud and frequent laughter. Andersen clearly knows office worker ‘types’ – I’m pretty sure I’ve temped in this office, with the wine-swigging receptionist dressed up to the nines for the Christmas party. His characters are well-drawn, all hiding – and gradually revealing – insecurities, vulnerabilities and flaws. My only criticism of the evening was that I was left somehow dissatisfied. We’d spent the past couple of hours watching these people be caustic and despicable; I would have liked to have seen some sense of a journey, of an imminent change or a lesson learned. Furthermore, the play looks at an office in crisis, but fails to give much insight into the wider city (and world) in financial crisis at that time. Instead, the script seems rather superficial; I felt that this office would continue much the same the next day, albeit minus an employee. But perhaps that is part of the point: life goes on, staff and crises come and go, but there will always be offices with snarky workers and drunken, regrettable Christmas parties. Definitely not a family show – heed the 16+ guideline! But if you fancy a biting, funny antidote to Christmas schmaltz, then Saxon Court is well worth seeing. It runs at Southwark Playhouse until December 13th; click here for showtimes and tickets. Our favourite scribe dwarf Ori, aka actor Adam Brown, is appearing on stage in London! 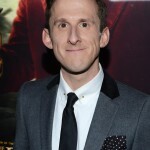 Brown will be in Made by Brick’s production of Saxon Court, which runs at the Southwark Playhouse from November 19th to December 13th. Tickets are available from the box office – click here to purchase.